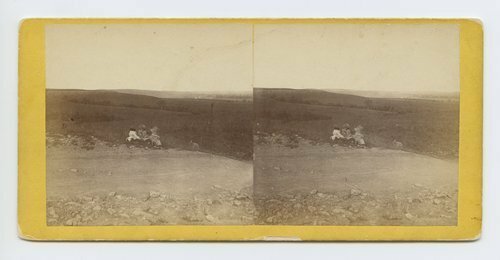 This stereograph shows three people seated on a hill above Fort Riley, Geary County, Kansas. It is from Alexander Gardner's series, Across the Continent on the Union Pacific Railway, Eastern Division. View in Kaw Valley from hill above Fort Riley, Kansas. 420 miles west of St. Louis Mo.